The lower portions of Central Avenue were created by the merger of several old streets and cutting through private property. The upper portion of the street came about with the help of the Legislature. In 1864, legislators passed a law empowering Newark, East Orange, West Orange and Orange to extend the avenue westward to Valley Street in West Orange—a distance of three miles at a width of 100 feet. It had become obvious that a broad thoroughfare connecting Newark with the Oranges was needed. At that time, Newark's population was 70,000. The combined inhabitants of the Oranges was placed at 15,000. Work began in 1864 with Newark condemning land to extend the street all the way to Broad Street. Before 1865, Newark had several Broad streets. Broad Street north of Clay Street was called East Broad Street. The portion below Chestnut was known as South Broad Street, and the section at Lincoln Park was referred to as West Broad Street. The confusion that arose resulted in their renaming by the Common Council. North Broad Street became Belleville Avenue and at the other end of town West Broad Street became Clinton Avenue. These changes took effect on Dec. 1, 1865. Finally in March 1927, Belleville Avenue was again renamed. This time is was called Broadway, a name that has existed ever since. For much of the 19th century, Prince Street was the main street of Jewish Newark. But it was much more than just a street. It became an icon of the old Jewish community. For many, it represented the first step in an immigrant journey from a pushcart era to teacher, banker and beyond. It was the testing ground for American-Jewish immigration, an area where outdoor shopping went on for a good portion of a century. From its earliest days of existence as a street until the late 1930s, it was an outdoor green grocer and a bargain basement emporium, virtually a place to buy everything. As the German, Russian, Austro-Hungarian and Polish Jews became prosperous they began moving to High Street, Weequahic and then to the suburbs, and the old street began to quickly decline. Said one observer: 'Why, it used to be that people from all over the county came to Prince Street to shop. You'd see big Cadillacs and Packards here to do the weekend buying.' (Sunday Call, 1938). But people moved on, urban decay set in, and today it is even hard to find where the street even existed, for it is a collection with empty lots awaiting the westward march of Society Hill to breathe new life into it once more. Thomas Raymond, one of Newark's best-known former mayors, has not one, but three streets named in his honor. The obvious one is Raymond Boulevard, created in the 1930s to provide grand exits into and out of Pennsylvania Station. As Newark's mayor, Raymond will be remembered for a raft of improvements in the 20th century Newark. All had the backing of the Board of Trade. This combination of power resulted in the airport, the seaport, the city subway, construction of the present Penn Station and endorsements of the Newark Public Library, Newark Museum, and the New Jersey Historical Society. Raymond Plaza East and Raymond Plaza West are appropriately named in Raymond's honor since he was an important leader who pushed for the construction of the present station, which has become the state's busiest. Foremost, it is a focal point of Newark's present rebuilding and renaissance activities. Raymond Boulevard, which is less than 70 years old, not one of those Indian trails or original colonial turnpikes we mentioned, was designed to break up the traffic at Broad and Market streets. 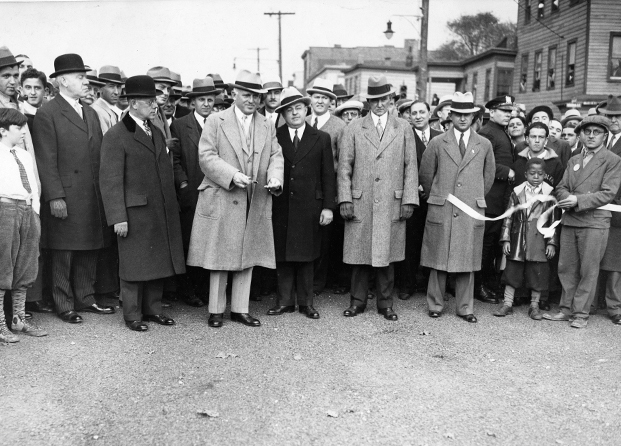 As mayor, Raymond also was in part responsible for draining the old Morris Canal and the construction of the Newark City Subway. The highway over the top of the subway was appropriately named in Raymond's honor. This construction was 'one of the most far-reaching operations Newark has ever undertaken.' (Newark News, 1932). If you don't believe that, just drive down the boulevard early in the morning when the mass of traffic is directed at the city's center. Every two minutes a subway car is following your steps below ground. An ancient road, one of the Ironbound's two main arteries, Ferry Street was the site of Washington's return home after bidding farewell to his troops at Fraunces Tavern in New York City. According to a 1947 Star-Ledger story, a New Jersey song was being sung at Newark. 'And then we crossed the ferry. All feeling very merry, From Drinking Tom and Jerry, All the day long.' Apocryphal almost certainly, it made for a good story. We do know, however, that Ferry Street is a 12-block Ironbound shopping street, recognized by most as the ward's most traveled thoroughfare. St. Stephen's German United Evangelical Church stood at 'The Bend,' the apex of East Ferry and Wilson, and the Rivoli was once one of Newark's best neighborhood movie houses. Perpendicular intersections to Ferry include Polk, Van Buren, Madison, Jefferson, Adams and Monroe—all named in the patriotic excitement of World War I with a certain amount of anti-German sentiment. In a 1947 Ledger article, Al Stern described the flavor of the street as 'never pushcart territory, but nearly all the larger establishments on the street were started on a shoestring.' Familiar merchants whose names were well-known to the community at that time included Ira Goldfinger, Ed Popeck, Isaac Rems, Jacob Goldberg and the Jelly Brothers. Said Stern, 'We know the neighborhood, most of the boys weaned on merchandising problems and the minor tragedies of the street.' That was Ferry Street six decades ago before Newark became known as the largest Portuguese city outside of Portugal, a street of several cultures.